Given the importance of the topic, it is hardly unexpected that the column attracted some 600 comments. But far more surprising was the overwhelmingly negative response of those readers. Given that the Post is a centrist-liberal newspaper and Miller a centrist-liberal columnist, one suspects that the vast majority of the commenters were similarly of the centrist-liberal orientation. But I suspect that most of their hostile remarks would have been indistinguishable from what would have greeted a similar suggestion posted on National Review or FoxNews or the Koch-funded Americans for Prosperity; and therein lies a tale. Although the ideological spectrum of American political discourse is casually rendered along a Left-to-Right spectrum, the range of views obviously has high dimensionality; and projecting an idea-space of ten or fifteen independent degrees of freedom onto a single axis is surely absurd, with even the two most prominent dimensions of “social issues” and “economic issues” failing to capture the underlying reality. Thus in 2008 we saw many of America’s most influential Republican pundits urging Sen. John McCain to select Sen. Joe Lieberman as his vice presidential selection to assuage and reassure distrustful conservatives. This came despite Lieberman having one of the most liberal Senate voting records on hot-button social and economic issues such as abortion, gay rights, gun control, affirmative action, immigration, taxes, regulations, and almost everything else, while even having served as candidate Al Gore’s loyal vice presidential Democratic pick just a few years earlier. But in 2008, Lieberman’s enthusiastic support for the continued Iraq Occupation and Bush’s “Great War on Terror” had momentarily eclipsed all other issues among much of the conservative elite. Similarly, over the last couple of decades, the economic well-being of America’s working- or middle-classes seems to have been relegated to an afterthought, not merely among Republicans and conservatives, but also among their Democratic and liberal opponents as well. The shocking truth that the average American family is probably poorer today in real terms than they were fifty years ago has been almost entirely ignored by both parties, and therefore ignored by the media as well, presumably under the theory that what people don’t know won’t really hurt them. In any event, a rise in the minimum wage to $10 or even $12 per hour would simply produce a one-time jump in prices, perhaps in the range of a couple of percent, rather than the sort of continuing inflationary spiral which might unnerve the Fed. Lower wage-earners would gain vastly more than they lost, the affluent wouldn’t even notice the difference, while hundreds of billions of dollars in additional disposable income for those who spend every dollar might finally jumpstart the economy, being an enormous stimulus package funded entirely by the private sector. In fact, the AFL-CIO has suggested that a Republican Party which strongly supported a higher minimum wage might warrant a strong second look from the vast number of ordinary American workers who had refused to even consider the plutocratic candidacy of a Mitt Romney. As it happens, I was recently invited by The Aspen Institute to speak at their DC headquarters on a March 6th panel addressing a minimum wage increase, and perhaps some of these important points will come out during the discussion. This same bipartisan elite consensus on the harmful effects of raising workers’ wages by law also manifests itself in a wide range of other issues. Leading Democrats and Republicans are now lining up in favor of a new amnesty program for America’s 11 million or so illegal immigrants, planning to combine this legislation with expanded quotas for skilled immigrants and also some sort of guestworker program for the lesser skilled. It is surely an odd thing for a country’s political leaders to propose substantial increases in new immigration at a time of such high unemployment and so much economic misery among the middle- and working-classes. Obviously part of the explanation is that our elites are doing very well financially, with the DC area having become America’s wealthiest region. But the political cross-currents are quite intriguing. Throughout most times and places, business interests have always tended to favor high immigration levels, for the obvious reason that a greater supply of available workers drives down wages and increases profits. So the responsiveness of Republican officials to their business donor class is hardly surprising, nor is the position of business-funded thinktanks and pundits. But for exactly the same reason, worker advocates have traditionally been doubtful or hostile to immigration, even if they might often be friendly towards existing immigrants or had themselves originally come from such a background. It is hardly surprising that America’s leading anti-immigrationist figure throughout most of the 1960s and 1970s was famed labor leader Cesar Chavez. Given such realities, the eagerness with which the Democratic side of the aisle have embraced a softening of immigration policy without any commensurate protections against job loss or wage decline is surely a sign they too have been captured by the business elites, just as was their widespread support for financial bailouts at the top of the economy and their disinterest in minimum wage increases at the bottom. As some Internet pundits have noted, President Obama actually traveled to Las Vegas, Nevada to announce his immigration proposal, selecting the highest-unemployment state to roll out a proposal hardly likely to alleviate that problem, but certainly one which would benefit the mega-wealthy employers of the low-wage service workers who staff the local casino-and-hotel economy. In our current political system, only the views—and dollars—of the latter much matter. Given the obvious connection between more immigrants competing for jobs and a relentless downward pressure on wages, I would suggest that the easiest way for both Democrats and Republicans to demonstrate that they are not wholly owned subsidiaries of our business class would be to explicitly link the two issues by attaching a large rise in the federal minimum wage to any proposed immigration reform. After all, the primary force which originally drew those 11 million illegals to America was the attractive availability of so many millions of low-wage jobs in our country, and unless this suction force at the bottom of the economy is eliminated, more border crossers will eventually come to take their places once the current ones are legalized. As I have argued at length elsewhere, immigration and the minimum wage are deeply intertwined policy issues, and should naturally be addressed together. Raising our minimum wage to $12 per hour as part of the proposed amnesty legislation would probably do more to solve future immigration problems than would any sort of electronic fence or national ID card. On a somewhat different matter, on Tuesday I published an NRO op-ed suggesting that the apparent Asian Quota policies of Harvard and its Ivy League peers might undercut the 1978 Bakke decision that has provided the legal basis for modern affirmative action, a timely question given the Fisher case now pending at the high court. The response to my article was very heartening, including a lengthy comment-thread and with the article itself being tweeted out to a hundred thousand or more mainstream conservatives. Most importantly of all, my piece received prominent notice at ScotusBlog, the leading blog for Supreme Court legal discussions, and one way or another must surely have now gained the attention of the individuals crafting the Fisher decision, at least if that ruling has not already been finalized. As it happens, my analysis drew the attention of a prominent conservative hardliner, someone very critical of the Republican establishment, who wondered why my sole focus had been on Asians, rather than on the white victims of affirmative action in college admissions. Obviously, the latter do exist, since percentages must total one hundred, and the increased allocation of elite admissions slots to blacks and Hispanics are surely not all transferred from Asian applicants. But this point actually highlights the long victory of rhetoric over reality in conservative circles. Over the last fifteen years, Republicans have steadily retreated on their longstanding opposition to racial preferences, with Bush’s 2000 public advocacy of “affirmative access” being merely a notable signpost. Efforts were made to mask this surrender through the gradual replacement of substantive positions by poll-driven phrases, and conservative political consultants soon discovered that although the term “affirmative action” had considerable popularity, “racial quotas” were widely disliked. Thus, opposition to “quotas” became the sound bite regularly dropped into the speeches of Republican candidates and office-holders, allowing them to check off that particular box on their conservative score-sheet. The problem with such an approach is that “racial quotas” are already illegal in America and have been for decades, and their use in college admissions was explicitly prohibited under the original Bakke ruling. So conservatives have been safely attacking what almost no Democrat will publicly defend, which hardly indicates any real desire to change existing social policy. The trajectory of white enrollments tells a very similar story, showing nearly a ten point spread between white numbers at Columbia and Princeton, and considerable fluctuations over the years. On average, white percentages have declined substantially over the last twenty years, but so has the white fraction of the college-age population, and the two trends have generally moved in parallel. The range of white percentages across the Ivy League in 1990 was roughly as wide as the range today, with no sign of collusion or “quotas” in either case. Thus, by abandoning criticism of affirmative action for the softer ideological target of minority “quotas,” conservatives actually attacked a straw man, and even a cursory examination of enrollment trends would call their bluff with regard to whites, blacks, and Hispanics, with no quota evidence being visible to the naked eye. But the Asian situation is entirely different and the statistics for Asian enrollment do indeed show extremely strong evidence of such secret “racial quotas.” This demonstrates that the top Ivy League have been dishonest regarding their anti-quota claims for decades, perhaps since Bakke, and completely demolishes their credibility on the matter. This was the central argument of my NRO column. Thus, we find America’s two major political parties at a strange ideological crossroads. Over the last couple of decades, the Democrats have totally abandoned their support for a high minimum wage, despite the enormous popularity of that issue both to their own base and to the country as a whole. During this same period, the Republicans have similarly abandoned their opposition to affirmative action, an issue which had long inspired many of their grass roots supporters and also proved very popular among the working-class blue-collar Democrats who often decide presidential elections. On a related matter, Scott McConnell attended last week’s Yale Political Union debate on affirmative action, and has provided his own somewhat generous account of how the lively evening unfolded, as seen from a seat in the audience. 35 Comments to "The Minimum Wage, Immigration, and Affirmative Action"
Raising our minimum wage to $12 per hour as part of the proposed amnesty legislation would probably do more to solve future immigration problems than would any sort of electronic fence or national ID card. How about a physical fence? Imagine the synergistic effect of a physical fence and a minimum wage raise put together. 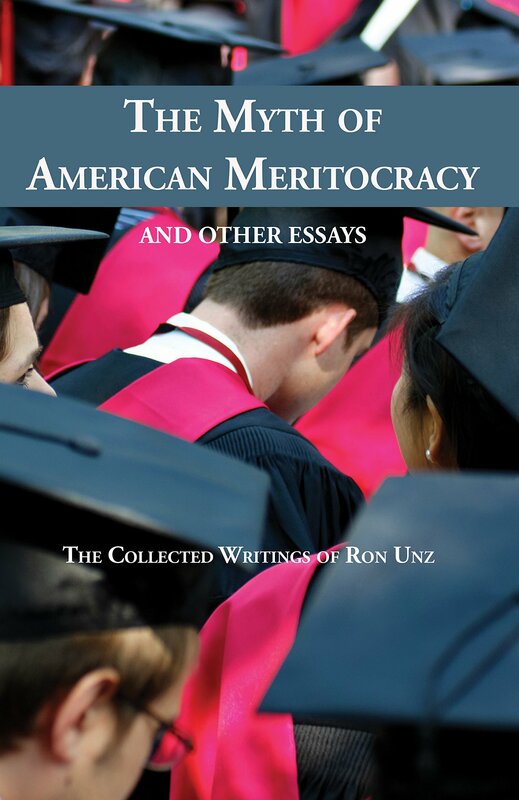 I think Ron Unz may have a narrow definition of “racial quotas” and a complementary broad understanding of “affirmative action” in the context of traditional Republican conservative approaches to this issue. In the 1970?s we in College Republicans agreed that “affirmative action”, in the sense of going out to find and encourage members of minority groups to develop an interest in a field and apply for jobs or schooling in that field, was an appropriate path for schools and other employers to take. What should be forbidden, “racial quotas”, did not encompass only a strict number of hires or admissions which must be filled, but also any admissions or hiring process which was not race neutral – which did not judge all applicants on the basis of the same criteria, whatever those criteria might happen to be, regardless of race. We called for the end of processes which placed into different categories for consideration men and women, black and white, or any similar division of fields of applicants, selecting members of one group for hiring or admission on the basis on one scale and members of other groups on the basis of another scale. We called explicitly for “color-blind” hiring and admissions, which we understood as being perfectly compatible with our version of “affirmative action”. Perhaps the Republican Party has strayed from this vision of its leaders younger years. But if it has, I don’t recall any public pronouncements amending the old platforms. If Democrats today seem less committed to the minimum wage than in days of yore, it may be because their largest growing constituency are the ranks of the unemployed, for whom they are continually pressing for more and longer benefits, to be funded by employers and taxpayers. These are the people who are most hurt by minimum wage legislation, because increasing minimum wages price them out of the job market even further. The average American “working man”, who profited from minimum wage laws, even if they were working for wages much above the minimum, but specifically pegged thereto, is one of a breed which is declining in number and, similarly, in influence in the party of Franklin Roosevelt and Lyndon Johnson. Why cannot we start a party that favours stimulating the American economy by building and manufacturing things here and paying Americans (not foreigners) a legal, livable wage for this work? Is the AFL-CIO signalling they would be willing to co-operate? Mitt Romney did everything he could to make the election a referendum on social security and Medicare, even naming a vice president who was known for nothing other than his desire to take a hammer to them. But when he lost the liberal media recast the election as a referendum on immigration. No matter who won the elites were clearly going to claim victory on one of their issues or the other. Why not? Since both parties are effectively run by the very rich. I, too, am amazed that both political parties get away with ignoring middle class concerns. Republicans with their super hawk madness and Democrats with their social issue radicalism both seem to care less about the sinking middle class. Maybe a higher minimum wage needs to be considered, but wouldn’t that be a magnet attracting even more illegal immigrants? I would suggest that the easiest way for both Democrats and Republicans to demonstrate that they are not wholly owned subsidiaries of our business class would be to explicitly link the two issues by attaching a large rise in the federal minimum wage to any proposed immigration reform. I would suggest that the easiest way would be to drop the support for amnesty and to propose mandatory E-Verify, a border fence, and an end to chain migration. Why do you accept amnesty as something that must be done? But you see Mr. Unz, the anger/opposition has never been about affirmative action per se or about any abstract unfairness of the policy. This country has always practiced affirmative action in one form or another (it largely benefitted just white men). Note there is no popular “anger” at legacy admissions, there was very little when Jewish applicants were discriminated against, and there is very little now re the situation of Asians. Mr Unz you continue to have great insight into the current state of our country.Unlimited political contributions and media concentration and control are imporant factors that enable our unrepresentative elites to harm the middle and working classes.The corrupt process that chooses who is admitted to the elite ivy schools and then chosen for the most prestigious and best paying jobs is also part of the problem.The demonization of people like Pat Buchanan, who actually advocate for the majority,by these same elites suggests something else.Your discovery that 65-70% of the best performing high school seniors are non-jewish whites but represent only about 20% of the students at Harvard and Yale needs to be further explored.Thanks again and keep up the good work. It’s interesting that Unz goes on at length with a range of liberal-style ad hominem arguments in support of a higher minimum wage (it would be nice if poor people made more money, and anyone who disagrees is just a greedy capitalist meanypants! ), without so much as addressing the fundamental objection to that position. Why is it that he believes the fundamental principle of economics, the “iron law” of supply and demand, or the price function, is in fact incorrect and price floors are actually an economic positive? Given that, what logical argument can be made against full Marxist central planning? It’s a sad sad commentary. Having read those responses myself to Mr. Miller’s Post editorial, the only conclusion I can come away with is that Americans have become petty and mean regardless of political stripe. Unz: [edited] A rise in the minimum wage to $10 or even $12 per hour would simply produce a one-time jump in prices. Lower wage-earners would gain vastly more than they lost. Mr. Unz, what are you relying on for that astonishing statement? You are proposing that a law can produce wonderful prosperity by forcing employers to pay some people more. In your view, the employers would just do it, with no other consequences. Consider the taxes paid by employers when they employ people. I don’t quote Wikipedia as gospel, only that it presents things clearly. [edited] In economics, “tax incidence” is the analysis of the effect of a particular tax on the distribution of costs and benefits. A tax is said to “fall” upon the groups that, at the end of the day, suffer a loss of income because of the tax. The key concept is that the tax burden does not depend on who pays the tax dollars (say an employer), but on the willingness of customers to pay more (the elasticity of demand) compared to the willingness of employees and investors to receive less (the elasticity of supply). Businesses are more sensitive to wages than employees. So, payroll taxes, employer mandates, and other taxes collected from the employer end up falling on the employee. The tax is passed onto the employee in the form of lower wages. An increase in the minimum wage is a sort of tax which an employer pays directly to the employee. Still, the employee does not benefit, because the employee pays that tax in various ways. [edited] The most likely outcome of a minimum wage increase is confirmed by Neumark and Wascher and is consistent with the Law of Demand. Everything beneficial for unskilled workers decreases, such as employment levels, hours worked, fringe benefits, subsidized uniforms and food, and training. The demand curve for labor slopes downward. That is, businesses hire fewer workers and give fewer non-wage benefits when minimum-wage laws force them to pay a higher wage. At the extreme, if neither the employer nor the employee can pay the tax (the economics are “inelastic”), then the employee is not hired, is fired, or the business closes. A long, clear academic paper. Looking at an extreme, why not set the minimum wage at $30 per hour? Of course, businesses paying a lower wage would fold up, and millions of workers would wish that they could find a job for $10 per hour. Price floors do have the effect of reducing overall employment, it’s true. Setting a price floor will attract more workers into the market but reduce the number of job openings. Very good! You were paying attention in first year econ! But notice that Mr. Unz addressed that point. Why do we have less of a problem with illegal immigration today compared with five or ten years ago? Because the supply of jobs, including the low-wage jobs taken by illegal immigrants, is smaller due to the recession. Raising the minimum wage would indeed exacerbate that problem. But one effect of that would be continuing that disincentive to migrate here in search of work. In other words, raising the minimum wage actually helps solve our illegal immigration problem. And it also provides a boost in the disposable income available to people at the bottom of the income scale (I wonder if you were paying attention in your macro class as well as you obviously were in micro). And that has a multiplier effect as it cycles through the economy. As he noted, it’s basically a stimulus that doesn’t add a cent to the federal deficit. As noted, the one group it doesn’t help much is the unemployed. The hope is that the stimulative effect of the increase helps offset the effect of the price floor. That’s debatable. Still, we’ve seen the failures of austerity overseas and the costs of government stimulus here. Trying this certainly can’t hurt. One thing I’d like to see addressed is how federal regulations fall disproportionately on people holding lower status jobs. I could go on and on about how federal regulations affect truck drivers, my current profession. It’s true that in many cases, federal hours-of-service and safety and maintenance regulations do help protect employee drivers from abuse by employers, but it’s also true that there’s a very high degree of entrepreneurship in the industry where the employee is effectively being protected from himself. (And then there are the regulations that are actually counterproductive to safety in practice, but that’s another story). Contrast this with the oversight of high status jobs. The financial industry is an excellent case in point. The practice of law is another. What’s also interesting is the regulation we don’t get. Standards for obtaining a commercial driver’s license are laughably weak. But strengthening them would put a bigger bar in front of entry into the industry and some large and influential trucking companies basically make their money paying low rates to entry level drivers, which means they depend on a large pool of drivers moving through the CDL mills. But basically, it’s interesting to note that the feds take a paternalistic approach to certain classes of people in certain industries for safety reasons, but not others. Crash a truck and they’ll be all over you. Crash an economy, not so much. In addition, if you believe Yglesias is a great friend of left-ish economics, you really should read more into him. He’s a neoliberal with libertarian tendencies who happens to have his good points (monetary policy) and his bad points (education reform/labor issues) to this unreconstructed social democrat. OTOH, on actual sites where you might see actual liberals talk about things (ie. DailyKos/Balloon Juice), you’d see far more support from the Democratic base instead of from columnists who’ve never had to work a day in their life since they went straight from Harvard to an internship to a paid blogging job. Just as MMT thinks printing money would be the solution – but then why not just send everyone an envelope with $1million?, how is raising the “minimum wage” going to help if there are businesses on the edge of bankruptcy or who can only afford a total cost for all wages of X, so you would just reduce the number of employed? Why not make the minimum wage $40/hr or more so everyone – including all the college graduates working at Taco Bell – wealthy enough so they can afford everything? You miss that in order to PAY someone X (including the federally mandated benefits not part of the wage), the employee must produce MORE THAN X. Sometimes you can raise prices, but if this affects restaurants, people will eat at home, so there will be massive bankruptcies and unemployment (what, people won’t pay $200 plus tip every night?). This is the same nonsense that doubling tax RATES will double tax revenues. It often decreases them. The luxury tax destroyed the domestic yacht industry. A few places have “living wage” laws, but can’t keep up. The only place wages are naturally high is in the oil-boom region of North Dakota where someone unskilled can get over $100k so WalMart has to pay to compete – but must eat the loss or raise prices. If you think it is such a good idea, go into business and do what you think is right. Unfortunately due to his heroic attempt to craft some proposals that are acceptable I think Unz has come up with the same sort of ideas that are of a piece with so many other policy prescriptions you see these days that, at a minimum, are not really designed to get at a problem, but instead to just make it look like same. (And to often to accomplish some other purpose than the announced one entirely.) Hence, like Unz’s ideas here, they seem absolutely allergic to any of the common-sense solutions for some problem out there that would naturally strike people in favor of some odd, jury-rigged, counter-intuitive and highly questionable plan that at worst aren’t just distractions but are outright shams. So c’mon, Ron, if you really want to get wages up you don’t just try to artificially make it look like that via mandating same (and in the process tanking millions of jobs), nor do you count on some strange logic saying that raising wages won’t attract more illegal immigrants. And if you want to crack down on future illegal immigration you get serious about building fences and enforcing e-verifty, and if you want to deal with the present illegals then you either let e-verify encourage them to self-deport or you swallow hard and give them amnesty but don’t pretend that same doesn’t have costs, period. Like I say, while Unz’s intent is admirable here I think it’s lead him into the sort of Make-Beliveland that we’ve constructed with all sorts of things to pretend we are really addressing things. Want to/need to keep your interest rates down on your bonds? Well, no need to manage your finances so that private investors find them attractive. Instead just get another branch of government (the Federal Reserve) to buy them from your selling branch! Trillions upon trillions of dollars of them! We just can’t keep doing things like this, Mr. Unz. You an’t finesse everything. At some point in every game like this the music stops and things begin to hit the fan. I just can’t wrap my head around the way that people are absolutely certain that increasing the minimum wage is a bad thing because of a variety of theories and weak association studies looking at the issue based on the past. Meanwhile, the obvious fact that giving more money to people who (unlike the wealthy) will turn around and put it back into the economy? It’s like that reality doesn’t exist. Not to mention that if pure economic efficiancy is the only thing which matters, well then, what was wrong with slavery and feudalism? Those were highly efficient systems for those who benefitted from them. No doubt we could go back and show how getting rid of those systems resulting in all sorts of bad effects like inflation, loss of the value of capital investments, it probably did wonky things to land values, screwed up taxes bases, etc. But the economy has to have a moral component or it’s just another system which is simply the latest variation of “how wealthy, powerful people run things”. A person who works all day should make enough money to support themselves. A person who works all day should even make enough money to start a family. A system which doesn’t allow that is immoral and broken. Even if raising the minimum wage would create the sort of problems people fear, we can figure out ways to deal with those problems. Avoiding them is in no way a justification for having masses of people who work their lives away and still can’t afford basic necessities without government assistance. I can see it now: Republicans propose a border fence, but obviously can’t do anything about it for four years…and during those four years, you’ve given Obama a weapon to hit you with over and over. Meanwhile, Rubio tells Hispanics not to vote for the current crop of Republicans. “But you see Mr. Unz, the anger/opposition has never been about affirmative action per se or about any abstract unfairness of the policy. This country has always practiced affirmative action in one form or another (it largely benefitted just white men). Note there is no popular “anger” at legacy admissions, there was very little when Jewish applicants were discriminated against, and there is very little now re the situation of Asians. 1) There are fewer legacy admissions than affirmative action admits, and the legacy admits get less of a boost. Plus, legacies and affirmative action have completely different justifications, so they are not comparable. 2) If you read Mr. Unz’ original piece, you would have seen that the biggest losers in the modern admissions game are not Asians, but non-Jewish whites. I have to respectfully disagree with Mr. Unz here. I have worked more than a few minimum-wage jobs in my life, and I am on firmly on the Low end of the American economic spectrum. From my perspective as a poor, working-class person, raising the minimum wage would accomplish nothing or even have a negative impact. Raising the minimum wage to $10 (or hey, let’s make it $20) an hour sounds nice for a moment. But so does printing hundred dollar bills and dropping them from the sky on all us poor folk. It sounds nice for a moment. In reality, it is a rather childish band-aid on the real problem. The real problem is that filling a minimum-wage job, say, flipping burgers at McDonald’s or pumping gas at Chevron, now incurs an application, tax, and liability process as arduous as becoming a licensed pilot or getting a national-security clearance was fifty years ago. The mountains of paperwork and regulations are smothering. And once an employee is hired, it’s just as much of a pain to fire them. It creates a stagnant and entrenched climate in business, where employees have no incentive to work hard once they’re hired and management has no incentive to take any risks on new personnel. I have witnessed this up-close and personal in various settings. If tomorrow I woke up in an alternate reality where an able-bodied adult could go pick up work for $5 an hour (cash) with nothing more than a state-issued driver’s license and a pair of work boots, I might be tempted not only to wade back into the labor market, but to start my own business. I’m no economist, but I suspect there might actually be more jobs available and more workers to fill them in such a world. Maybe I’ve just been watching Terry Gilliam’s “Brazil” too much lately. Call me Harry Tuttle. I can see it now: Republicans propose a border fence, but obviously can’t do anything about it for four years…and during those four years, you’ve given Obama a weapon to hit you with over and over. I think that you would find that supporting a border fence would not lose the Republicans very many votes, and would rally the working class to them. I daresay, the number of Latinos who are citizens and who would vote for the GOP because of a stronger immigration policy would likely outnumber those who would vote against it , if the GOP explicitly pushed the policy as a pro-worker and pro-wage policy. The idea that most Latinos really, really care about immigration and that amnesty is the big issue keeping them from voting GOP is really off-base, and is mostly promoted by elites with a personal interest in more immigration. Meanwhile, Rubio tells Hispanics not to vote for the current crop of Republicans. Right, because that would help his chances of moving up in the party so much. McCain and Graham became temporarily more restrictionist when they realized that the base hated amnesty, and Rubio can be pushed the same way. Raising the minimum wage is a no brainer as it is less than the 1968 version in real dollars. That said, the fact neither the Democrats or Republicans support it isn’t that surprising as they are both part of the Corporate States of America. As that bastion of conservatism, Bill Hicks, said many years ago, they are just two sides of the same tarnished coin. To those who question why “amnesty” should be granted to immigrants who are here without papers, working in jobs and supporting their families with false papers or by taking jobs under the counter, the answer is this: If they are not granted amnesty they will not leave the country, they will not leave the lives and families they have made for themselves, and if deported they will break the law to return. It’s a Sisyphean task, with borders as long as porous as the USA has, to try. 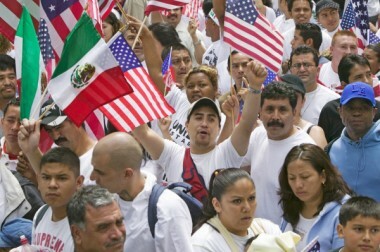 By granting these residents legal status you bring them out of the underground economy and you put them on the same basis as American citizens in seeking and keeping jobs – they can no longer be employed for sub-minimum wages and exploited as “illegals”, and neither will Americans lose jobs to those who will work for less than minimum wage because those taking those jobs can’t report their bosses as “legal” workers could. If, on the other hand, Congress were to raise the minimum wage, even after granting amnesty to those who have lived here long enough, free of criminal records, to qualify, Congress would be inviting a new flow of “illegals”, for the simple reason that there will be businesses with jobs that need doing, but can’t have them done at the cost such a greater minimum wage requires, so they will be magnets for new immigrants to enter the country without work visas because even sub-minimum wages are attractive to them, and the whole process that commenced in 1986 will begin all over again. The problem with the 1986 amnesty was not the granting of amnesty. The problem was twofold – 1) Congress didn’t allow sufficient work visas to be issued to meet the demand, both by domestic employers and foreign labor, to have them filled; and 2) increases in the minimum wage made American citizens legally unemployable in the many jobs that were going wanting but were not worth to the employers the cost that minimum wage laws entail, hence consigning those jobs to the “illegal” job market. Why not just eliminate payroll taxes (FICA) in favor of an energy/consumption tax. It will effectively raise take home pay 7% and make hiring employees cheaper by 7%. We could make it progressive by implementing a broader EIC type program if progressivity of the tax code is a concern. This isn’t the same as $10-12/hr of course, but it does take things in the right direction. If tomorrow I woke up in an alternate reality where an able-bodied adult could go pick up work for $5 an hour (cash) with nothing more than a state-issued driver’s license and a pair of work boots, I might be tempted not only to wade back into the labor market, but to start my own business. I’m no economist, but I suspect there might actually be more jobs available and more workers to fill them in such a world. Don’t employers already do that by hiring illegals and they usually get around regulations, conservatives don’t think of that. Just boot the illegal immirgants or prevent companies from hiring them and wages will rise. Thank you for this article Mr. Unz. I am genuinely shocked that Australia is succeeding with a $15 minimum wage and 5% unemployment. It goes against most economic conventional wisdom, but facts are facts. As you note, put the $15 wage in the context of decreasing middle-class purchasing power, lower-than-healthy inflation, and reduced transfer payments, and it starts to makes sense. For your amusement, here is John Stossel’s ridiculous attempt to rebut the $15 wage/5% unemployment factoid. Check out the first comment. I have found most short libertarian arguments about economics – op-eds, blog postings, letters to the editor and blog comments – to be abstract, arrogant and patronizing, with microeconomic examples poorly applied to macroeconomic phenomena. Exactly right, Mr. Unz, although I would second TomB on ending our “Free Trade” policies offshoring jobs. And while I would make the processing of legal immigration easier, I see no need to give Bill Gates and Co. the gift of increasing quotas for high skill labor. If they can’t fill such jobs, let them invest in training employees instead of outsourcing that to India and China, too. I have no use for either of the twin parties of Capital, but it has boggled my mind the last few years that labor and Democratic Party leaders, at least at the state level, have not been putting minimum wage increases on the ballots of those states that allow citizen-initiated referenda, since they are a proven vote-getter and attract irregular voters to the polls. The last round of ballot measures did very well in 2006 and helped the Dems electoral wave that year. One of my arguments for the minimum wage increase is for a reduction in corporate welfare. Items like the Earned Income Tax credit essentially exist to prop up low wage payers at the expense of all tax payers. In an age where corporate profits are at one of the highest points in history, and median household income has been flat or declining, it makes no sense NOT to shift some of the burden back on to business. A living wage should never be paid for by the masses. It is simply another form of privatizing the gains and socializing the losses. Interesting thoughts on the connection between minimum wage and illegal immigrants. I was always under the impression that minimum wage meant “entry level”, which is what the government forces employers to pay to train unskilled teenagers. But when Juan Q. Public spends 30 minutes doing the neighbor’s lawn for $40, we are no longer talking ‘minimum wage’ here. How many people really trust the polls, especially when they have their own agenda? The Rasmussen poll Reports are more genuine than the ones administered by the mainstream newspapers, who have a lean towards the Liberal biased idea of government, who already have partaken in a whole bunch of propaganda thrown into the daily headlines about illegal immigration. Alas, much of the media starves us of the truth and repeats the same old rhetoric about illegal aliens not stealing jobs from the 23 million American workers. Illegal Immigration is building into a verbal crescendo of volatile arguments and as most of us know, that if you were around in 1986 the word of Washington, talks with a forked tongue. THEY SIMPLY LIE TO US, ABOUT THE COSTS, THE SUPPORT AND THE PANDERING TO THE LARGE MINORITY GROUPS? Don’t matter which political Party you normally follow, this is about the “Rule of Law” costs involved and the consequences of this paramount issue. After the great amnesty nothing occurred that could be called real enforcement, the special interest groups saw to that. The promise of no more illegal immigration fell on deaf ears of both Democrats and Republics with very few calling foul and illegal immigrants kept on pouring in to this nation. The great border fence we were promised was cut short, because underhanded lawmakers secretly cut off most funding. That is why the two fences parallel to each other, for the rapid transit of Border Patrol vehicles in between the two barriers was ignored. Even the single fence we have today is no match for the drug cartels and the continuous insurgents of impoverished illegal migrants. Even a visitor tracking system is not up to the restrictions as seen in other countries, so we huge influx of foreigners that never go home. Today we have payback by the progeny of the 1986 Path to Citizenship pyramid of cause and effect. The current Dream Act is the cause, of not only the original amnesty, but years of unconcern of those we elect? From the same cause has been the enacted Family Chain Migration of the first naturalized citizens, were than able to petition for their family members. Then hidden amongst those families are other relatives or friends, who slipped into America and hide in plain sight, with a job and probably picking up welfare. This and more under President Obama’s sanctuary umbrella, as do thousands of pregnant moms, who have claimed citizenship for their many offspring and living of the public entitlement programs, because of the inaccuracy of the 14th Amendment. This must be changed, so no more children not accompanied by a U.S. citizen can claim this right? There is absolutely room for legal skilled workers, who have the experience to employ in specialist fields? If there is going to be anything like the travesty of the Ronald Reagan/ Ted Kennedy of Immigration Reform and Control act, then we must demand a secure impenetrable wall as in the State of Israel, the Legal Workforce Act and the Birthright Citizenship Bill. An amendment to the Birthright citizenship law will inevitable save trillions in taxes, and return this money to the legal populace, to our elderly who have been short changed, our homeless and our real low income. This illegal entry into our country will never be slowed, until we enforce the laws. I DO NOT SEE ANY END TO THIS MADNESS, UNLESS AMERICANS START CONTACTING THOSE THEY ELECTED TO CONGRESS. TO REPEAT THERE ARE ABSOLUTELY FREE FAXES YOU CAN SEND, IF YOU CAN SPARE A MINUTE TO JOIN THE NUMBERSUSA WEBSITE THIS IS A PRO SOVEREIGNTY ORGANIZATION WITH A GROWING MEMBERSHIP OF ORDINARY PEOPLE (LIKE THE TEA PARTY), WHO IS AGGRESSIVE IN STOPPING ANOTHER FRAUDULENT AMNESTY DECADES AGO. 53 percent said they would be more likely to support a political party that supports immigration law enforcement while 32 percent indicated that they would be more likely to support a party that supports legalization. I agree with all of you. Middle class (clean living, hard working, family orientated, caring, volunteering, community minded) people are usually ignored by the politicians because we are in the middle and that means political ground that blurrs the edges of your political stance. Who likes a ‘grey’ politician, we all prefer opinionated ‘black and white’ opinions. So teh only way to get listened to is a) reduce your debt; thus the banks don’t control you and you release yourself from teh work to earn money in order to wake up teh next day to do the same cycle. b) get to a point where retirement is a state of mind, not a point in time where you think your financial life and age will somehow ‘release’ your from this grindstone – are you just paying into a pension pot because you have a deferred life policy? and c) do the things that you like doing….. by the way ‘earning money’ is the only answer that you are not allowed! Why do all of this, well you no longer have to worry about a banker or employer telling you what you should be doing and secondly, you’ll have the time to do more of what you want. The indirect effect is that you will earn and spend less …. and pay less tax…. in turn that will upset the politicians …… in other words you will become more like (in contibution terms to the state) like the very rich and the very poor. … Then you can start changign the system by becoming a politician – why? what else do you have to do?